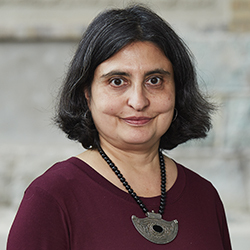 Lyla Mehta is a Professorial Research Fellow at the Institute of Development Studies at the University of Sussex, UK and a Visiting Professor at Noragric, Norwegian University of Life Sciences. She is a sociologist working on rights, access to natural resources and power/knowledge interfaces in policy debates, water and sanitation, gender and forced displacement, conceptual work on scarcity and uncertainty as well as peri urban and urban dyanmics as well as climate change. Research and field experience in southern and East Africa and South Asia. Consultancy work for the UN system, the World Commission on Dams and DFID. Convenor of the water and sanitation domain, STEPS Centre. Member of the scientific committee of the Global Environment Change and Human Security Project, International Human Dimensions Project (2005-2010) and steering committee member of the Bretton Woods Project (2002-2011). Editorial board, Water Alternatives and Conservation and Society. Team leader of the UN High Level Panel of Experts on Food Security and Nutrition (HLPE) on Water and Food Security.